Name Variation Edna A. Giebel was also known as Dena. Married Name circa 1921 As of circa 1921,her married name was Tessmer. Edna A. Giebel was born on 17 October 1891 at Wisconsin. She married Charles H. Tessmer, son of Charles H. Tessmer and Augusta Retzlaff, circa 1921. Edna A. Giebel died in March 1984 at Sheboygan, Wisconsin, at age 92. Edna A. Giebel obtained US Social Security Card at Wisconsin; last residence Plymouth, Sheboygan, Wisconsin. [S250] U.S. Federal Census 1930 U.S. Federal Census, by Ancestry.com, ED11. Dwelling 84. Name Variation Lucille M. Tessmer was also known as Lucile M.
Married Name 10 June 1951 As of 10 June 1951,her married name was Reinen. Lucille M. Tessmer was born on 30 May 1921 at Wisconsin. She was the daughter of Charles H. Tessmer and Edna A. Giebel. 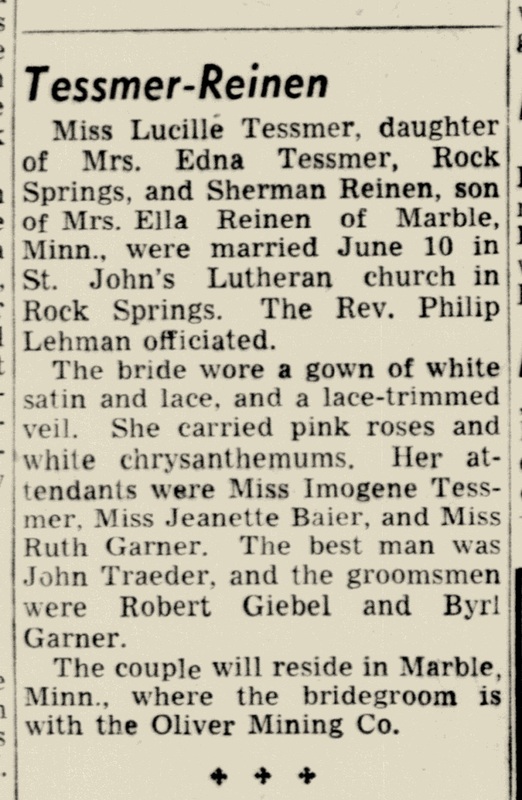 Lucille M. Tessmer married Sherman Reinen on 10 June 1951 at Rock Springs, Wisconsin, Lucille Tessmer and Sherman Reinen marriage announcement. Lucille M. Tessmer died on 30 October 1987 at age 66. Name Variation Roger C. Tessmer was also known as Rodger C.
Roger C. Tessmer was born in 1924 at Wisconsin. He was the son of Charles H. Tessmer and Edna A. Giebel. Roger C. Tessmer died in 1939. Alvin George Tessmer was born on 26 February 1929 at Wisconsin. Alvin George Tessmer died on 14 December 2005 at age 76. Alvin George Tessmer obtained US Social Security Card at Wisconsin; last residence Montello, Marquette, Wisconsin. William D. Spencer Jr. was born on 6 September 1949 at Carlinville, Illinois. He died on 29 July 2016 at age 66 William D. Spencer Jr., 66, a former Plymouth resident, passed away under hospice care at 3 p.m. Friday, July 29th in the I.U. Health – Goshen following an extended illness. For the past three years, Bill has resided in Lagrange. Bill was born in Carlinville, Illinois on September 6, 1949 the son of William D. & Norma Jean (Chapin) Spencer. The family moved to Plymouth, Indiana where Bill completed high school with the PHS Class of 1968. He then attended Barber College and began barbering in the Carlinville and Mendon areas. In Mendon, he assisted with farming. He transitioned to manufacturing in quality control to which he was very proficient. He had worked for Colt Industries in Quincy, Illinois, the Gunite Corporation in Elkhart and then Lycro Products Co. in Wakarusa. On July 6th, 2013 in Wolcottville, Indiana he took as his wife the former Pamela K. (Rosendaul) Hoff. The couple enjoyed worshiping at the South Milford Church of Christ in Wolcottville. Bill liked fishing and hunting, especially water fowl. He had served many years as a Scout Master and competed in muzzle loader events. He was also a longtime member of the Beagle Club in Bristol. Bill is survived by his father William D. Spencer Sr. of Plymouth, his wife Pam, son Shawn W. (Elizabeth) Spencer, daughter Nickole (Jeremy) Plank all of Goshen along with a step-daughter Amanda J. Dunn. Also surviving are three granddaughters, three step-grandsons and former spouse Karen K. (Kasparie) Spencer of Goshen. He also has four siblings who survive. Charles H. (Judy) Spencer of Bristol, Richard F. (Sandra) Spencer of Elkhart, Beth A. (Jeffrey) Siderius of Wheaton, Illinois and Mary L. (Damian) Mizera of Maryville, Missouri along with many nieces and nephews. Bill was preceded in death by his mother Norma Jean and a sister Sue Ellen Weyrick Wilson. Visitation will be held on Wednesday, August 3nd from 10 a.m. until noon in the Johnson-Danielson Funeral Home, 1100 N. Michigan St., Plymouth. Funeral services will be held there at noon with the Rev. Brian Walter presiding. Burial will follow in the New Oak Hill Cemetery in Plymouth. Willard Kasparie was born after June 1900. He was the son of William Clement Kasparie and Lucinde Caroline Conradine Arendt. Willard Kasparie died before 1910. Frank Calvin Baum was born on 3 February 1896 at Ohio. He was the son of Ambrose E. Baum and Gertrude E. Gallagher. Frank Calvin Baum married Lorain Elizabeth Kasparie, daughter of William Clement Kasparie and Lucinde Caroline Conradine Arendt, in 1920 at Adams, Illinois. Frank Calvin Baum died on 11 March 1962 at age 66. On 5 June 1917 at World War I Draft Registration, Quincy, Adams. [S245] U.S. Federal Census 1900 U.S. Federal Census, by Ancestry.com, ED135. Dwelling 13. [S244] U.S. Federal Census 1910 U.S. Federal Census, by Ancestry.com, ED186. Dwelling 124. [S243] U.S. Federal Census 1920 U.S. Federal Census, by Ancestry.com, ED35. Dwelling 4. [S250] U.S. Federal Census 1930 U.S. Federal Census, by Ancestry.com, ED37. Dwelling 243. [S373] U.S. Federal Census 1940 U.S. Federal Census, by Ancestry.com, Year: 1940; Census Place: Quincy, Adams, Illinois; Roll: m-t0627-00756; Page: 10A; Enumeration District: 1-40. Nickname Evelyn Loraine Baum also went by the name of Rusty. Name Variation Evelyn Loraine Baum was also known as Eveline. Married Name before 1942 As of before 1942,her married name was Gardner. Evelyn Loraine Baum was born on 10 March 1924 at Illinois. She was the daughter of Frank Calvin Baum and Lorain Elizabeth Kasparie. Evelyn Loraine Baum married Leo M. Gardner Jr. before 1942. Evelyn Loraine Baum died on 25 November 1993 at Colorado at age 69. Child of Evelyn Loraine Baum and Leo M. Gardner Jr.
Name Variation Ambrose E. Baum was also known as A. E.
Ambrose E. Baum was born on 26 September 1862 at Ohio also reported as Sep 1864. He was the son of Peter Baum and Mary S. (?). Ambrose E. Baum married Gertrude E. Gallagher, daughter of John H. Gallagher and Mariam R. (? ), on 16 January 1895 at Adams, Illinois. Ambrose E. Baum died on 8 December 1938 at Quincy, Adams, Illinois, at age 76. 1930 Quincy, Adams, Illinois He was listed as the head of a family on the 1930 Census at Quincy, Adams, Illinois. [S246] U.S. Federal Census 1880 U.S. Federal Census, by Ancestry.com, NA Film Number T9-1079 Page Number 410A. Married Name 16 January 1895 As of 16 January 1895,her married name was Baum. Gertrude E. Gallagher was born on 12 July 1875 at New York. She was the daughter of John H. Gallagher and Mariam R. (?). 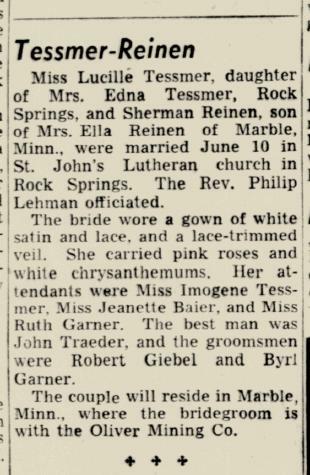 Gertrude E. Gallagher married Ambrose E. Baum, son of Peter Baum and Mary S. (? ), on 16 January 1895 at Adams, Illinois. Gertrude E. Gallagher died on 18 April 1944 at Quincy, Adams, Illinois, at age 68. 1930 Quincy, Adams, Illinois Gertrude E. Gallagher was listed as wife in Ambrose E. Baum's household on the 1930 Census at Quincy, Adams, Illinois. Gertrude E. Gallagher had 2 with 2 living in 1900 children. She had 5 with 5 living in 1910 children. Melvin Peter Baum was born on 20 July 1900 at Illinois. Melvin Peter Baum married Leta M. Tipton circa 1924. Melvin Peter Baum died on 28 January 1963 at Missouri at age 62. On 12 September 1918 at World War I Draft Registration, Quincy, Adams, Illinois. Leonard J. Baum was born on 5 March 1903 at Illinois. Leonard J. Baum died on 28 January 1966 at Santa Barbara, California, at age 62. Married Name Her married name was Peters. Virginia S. Baum married Julius Frank Peters. Virginia S. Baum was born on 27 November 1909 at Illinois. She was the daughter of Ambrose E. Baum and Gertrude E. Gallagher. Virginia S. Baum died on 29 August 1989 at age 79. John H. Gallagher was born in October 1850 at Canada also reported as Ohio. He married Mariam R. (?) circa 1873. John H. Gallagher died after January 1920. [S246] U.S. Federal Census 1880 U.S. Federal Census, by Ancestry.com, NA Film Number T9-0609 Page Number 453B. [S245] U.S. Federal Census 1900 U.S. Federal Census, by Ancestry.com, ED135. Dwelling 15. [S244] U.S. Federal Census 1910 U.S. Federal Census, by Ancestry.com, ED36. Dwelling 84. Name Variation Mariam R. (?) was also known as Marriam (?). Married Name circa 1873 As of circa 1873,her married name was Gallagher. Mariam R. (?) was born in February 1850 at New York. She married John H. Gallagher circa 1873. Mariam R. (?) died after January 1920. Mariam R. (?) had 5 with 5 living in 1900 children. She had 5 with 4 living in 1910 children. Married Name before 1920 As of before 1920,her married name was Snell. Ida May Gallagher was born in August 1884 at Michigan. Ida May Gallagher married (?) Snell before 1920. (?) Snell died before 1920. He married Ida May Gallagher, daughter of John H. Gallagher and Mariam R. (? ), before 1920. Name Variation Marriam Hildred Baum was also known as Mariam H.
Married Name 1917 As of 1917,her married name was Waddell. Marriam Hildred Baum was born on 26 December 1897 at Ohio. Marriam Hildred Baum married Oliver Elliott Waddell in 1917 at Adams, Illinois. Marriam Hildred Baum died on 7 December 1985 at age 87. Iva B. Gallagher was born in May 1882 at Michigan. Frank L. Gallagher was born in July 1883 at Michigan. He was the son of John H. Gallagher and Mariam R. (?). Peter Baum married Mary S. (?). Peter Baum was born circa 1836 at Ohio. Married Name Her married name was Baum. Mary S. (?) married Peter Baum. Mary S. (?) was born circa 1835 at Ohio. John Baum was born circa 1859 at Ohio. Lydia A. Baum was born circa 1862 at Ohio. She was the daughter of Peter Baum and Mary S. (?). Mary E. Baum was born circa 1868 at Ohio. Laura Gallagher was born circa 1873 at Ohio. Cornelius Prohl was born on 19 September 1794 at Bohnsack, West Prussia, Germany (now Poland). He was the son of Cornelius Prohl and Sara Tell. Cornelius Prohl was baptized on 21 September 1794 at Lutheran Church, Bohnsack, West Prussia, Germany (now Poland). Dorothea Prohl was born on 18 July 1778 at West Prussia, Germany (now Poland). She was baptized on 19 July 1778 at West Prussia, Germany (now Poland). She was the daughter of Cornelius Prohl and Sara Tell. Name Variation Rachel Prohl was also known as Rahel. Rachel Prohl was born on 13 December 1785 at West Prussia, Germany (now Poland). Rachel Prohl was baptized on 18 December 1785 at Lutheran Church, Bohnsack, West Prussia, Germany (now Poland). Anna Maria Prohl was born on 17 January 1780 at West Prussia, Germany (now Poland). Anna Maria Prohl was baptized on 23 January 1780 at Bohnsack, West Prussia, Germany (now Poland).